1. Surprise with Piano Pancakes – On a Saturday morning, surprise your child with Piano Pancakes topped with chocolate chip “quarter notes”. For each pancake on the plate have your child perform a piece for your family while you all watch in your PJ’s. 2. Balloon Surprise – Fill your kitchen cupboard with balloons that will spill out as soon as it’s opened. On each balloon, write something you love about your child’s piano playing (i.e. “I love hearing your music when I’m making dinner” or “You play your piece with so much expression”.). Ask your child to help you with dinner and wait for the cupboard to open. Read each balloon message aloud together. 3. Monday Morning Mirror Message – Use a white board marker to leave a surprise message on the bathroom mirror for your child on a Monday morning before he or she wakes up. Write “It makes me so HAPPY to hear you play the piano!” or something to that effect. 4. Sneak a Practice – Leave your child a note on his or her pillow on a weekend night that says “Tonight you get to stay up late! When everyone else is sleeping you and I are going to sneak downstairs so I can listen to you play the piano.” Serve warm milk and cookies in the piano room and light it by candle light only. This will be a memory not soon forgotten. 5. Take it to the Highway – Kids who are involved in sports get a lot of glory. Piano kids.. not so much. Make your child smile by writing a message on the back window of your car that says “My Kid Rocks on the Piano! Honk if you love music!”. Roll the windows down and let your child wave to the honking fans. 6. Build Excitement – Before recitals or performances, build excitement with a countdown. Use a blackboard or white board (or a piece of paper on the fridge) that says “___ More Days Until Max’s Piano Performance!” Showing you value involvement in performances ensures participation well into the teen years. 7. Surprise Sheet Music Shopping – Pick your child up from school and head out on a surprise trip to your local music store, offering the chance to choose any music book or piece of sheet music. The key is in looking with your child… spend enjoyable time browsing the books and finding just the right thing to take home. 8. Exclaim with Pleasure – You don’t always need to be fancy. Sometimes a genuine, enthusiastic and unexpected “Holy smokes that was AMAZING!” mid-way through his or her practice is all it takes! 9. Buddy Practice! – Piano practice can be lonely, but if there’s a buddy on the bench it can be a lot of fun. Even if you don’t have an ounce of musical knowledge you and your child can easily complete the activities found in this book which are designed to make piano practice fun, motivating and unique. 10. 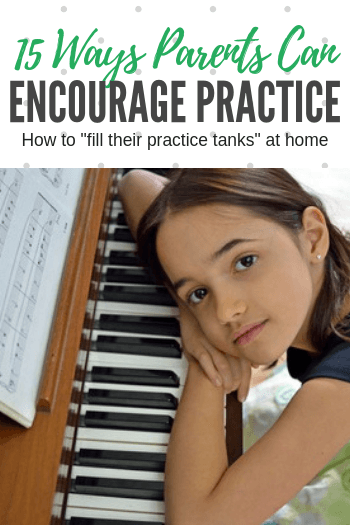 Make Piano Practice Time “Tech Free” – Whenever your child sits down to practice, turn off the TV, the cell phones, the computer, the Nintendo… everything. Allow your home to be filled solely with the music they are creating and allow yourself to be fully present. 11. Start a Warm Fuzzies Bag – Hang a pillowcase from the top of your piano. Each time your child practices during the week, handwrite a note about something you noticed was done well, a favourite song he or she played, how it improved your day to hear music etc. At the end of the week your child can open the bag and read your notes. 12. It’s UnBEARable – Find some Teddy Bear stickers and, using post-it notes, attach a bear sticker to 10 post-its. Write “It’s UnBEARable without your piano music! Play for us!” and hide them around your house in unexpected places. Your child will delight in finding these in the oddest places. 13. Host a Piano Picnic – Invite the entire family to a Piano Picnic Dinner. Spread out a blanket on the floor beside the piano. Serve cheese and grapes, yummy crackers, and tea and cookies. Have your child provide the dinnertime music in between bites. Drink your tea with your pinkies raised and speak in a very dignified manner (“Ohhhh… that piece was simply splendid my dahling… simply splendid I say.”). 14. Check In – When you’re on your way home, call your child from your car (using hands-free of course!) and make a special and heart-felt request for some driving music as you make your way home. 15. Post-Office Piano Package – Create a small package of treats and a note about how proud you are of your child’s piano accomplishments. Mail it to your child and allow it to be discovered it in the mail box. Do these take a little bit of effort? Yes. Does it take a whole lot of effort on the part of your child to master an instrument like the piano? Absolutely! By demonstrating just how much you care about their involvement in piano you lay a very strong foundation for years of musical enjoyment. Beyond that, you also help to strengthen self-esteem and self-image. So pick a “tank filler” and give it a try! Who Made The “Piano Method Book Rule”?